I barley remember this guy from Gavin and Stacy, but this picture alone makes me this that this is going to be a good call. Has Doctor Who ever had just one male companion with him? He has had male and a female companions over the years but i don't remember him having just one guy with him. I wonder if this is a sign that at least some of the series is going to be Doctor-stuck-on-Earth rather than having one episode in the school then *whoosh* adventures! Given how Capaldi's Doctor showed up it could be that he needs some practise/training before setting off at full speed. It would be cool to have two companions again even if one of them isn't Captain Jack. I hope he does become a companion. We've had too few male companions in the last few years, I think. Looking forward to the direction they're gonna go in with Peter Capaldi- hopefully we can get away with the `everyone wants to jump the Doctor's bones for no reason` trend that's plagued the last couple of years. We need more male companions so this news gets a thumbs up from me. Too bad it isn't Captain Jack but beggars can't be choosers. I love the way the characters all have to be 'relatable' now. Actually I don't, I'd ahve preferred a time agent or basically anything to a 21st century nobody. This guy as a more serious Captain Jack? Yes please. Hah, reconciling his quote with the picture of him took more effort than it should have. But seriously, DW is good for a laugh and to talk nonsense about. The last two companion pairs were fun so I'm sure this one will be too. So I guess this means Coal Hill School might be a recurring setting? That could be interesting; the oldest Doctor of the new series once again coming in contact with Coal Hill School. They might even throw in more references to his first companions. The more they reveal about the '8th' series, the more I'm convinced it's going to be filled to the brim with Classic Who references and foes. I'm half expecting a damn yeti to appear. When's this damned season starting? The only other things the channel this plays on offers are z-rated shlock movies, re-runs and shows I don't give a crap about. Ugh, no thanks. The point of the companions is to be more of an "anybody" than a nobody. While some writers treat that as an excuse to make basically a non-character blank slate, the new DW has had some pretty excellent companions. Making the companion a serious-attitude time agent would drastically alter the tone of the show. There are enough "serious" shows out there, I would like my Doctor Who wacky and childish with a grounding in positive humanism thank you. Some of the best companions were either people with significant specialisations or people from different times. Modern Doctor Who is incredibly lazy in just picking up contemporary British young people. For example Barbara, one of the original companions, was a history teacher who knew enough about history to basically pretend to be a reincarnated Aztec more or less successfully for four episodes (more tapering to less and I'm not counting the final episode of the serial, she screwed that big time). Barbara was still contemporary Earth but she had a very strong area of expertise, the same as Ian and getting beaten up. The only recent one I've liked has been Rory Williams, who admittedly I absolutely loved for bringing a fascinating dynamic to the show; that of someone who is travelling with the Doctor but for their own reasons and of someone who doesn't particularly like the Doctor when all's said and done. 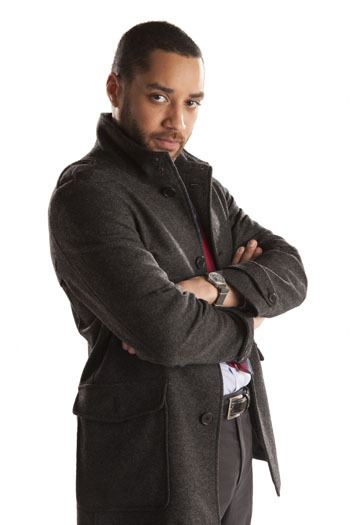 for a moment i thought the doctor will regenerate into danny pink. but it seems that he will, once again, only be the token black character with a bunch of one liners to tell. Ah, you know Barrowman will be in from time to time. The fans love 'im and he's harder to get rid of than the Master. Barrowman hasn't been on an episode of Doctor Who since Journey's End in 2008. As for this new guy. He looks good, for those who have been following Who rumors since Capaldi's era was getting ready to begin there had been rumors of a male teacher, nice to see it true. While it was very short lived the 1st doctor's only companion was Steven for part of The Daleks' Master Plan.